It takes a special mind and continual training to master the complexity of income tax. Luckily for you, Dale Kubiesa, your Accounting CFO has both. His goal is to craft the most aggressive strategies possible while keeping you and your company out of harms way. Dale will not only keep you up to date on any changes in tax laws and how they affect your business but also plan and coordinate your finances within the increasingly complicated requirements. Bottom line? Your Accounting-CFO can deliver maximum benefit with minimum risk. Definition #1: An unbiased examination and evaluation of the financial statements of an organization. It can be done internally (by employees of the organization) or externally (by an outside firm). Definition #2: An IRS examination of a taxpayer’s return or other transactions. The IRS performs this examination to verify the accuracy of these filings. 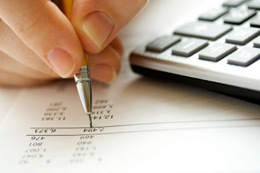 A CPA audit determines the overall validity of financial statements. A tax (IRS) audit determines whether the appropriate tax was paid. A CPA audit determines the overall validity of financial statements. A tax (IRS) audit determines whether the appropriate tax was paid. An internal audit generally determines whether the company’s procedures are followed and whether embezzlement or other illegal activity occurred.